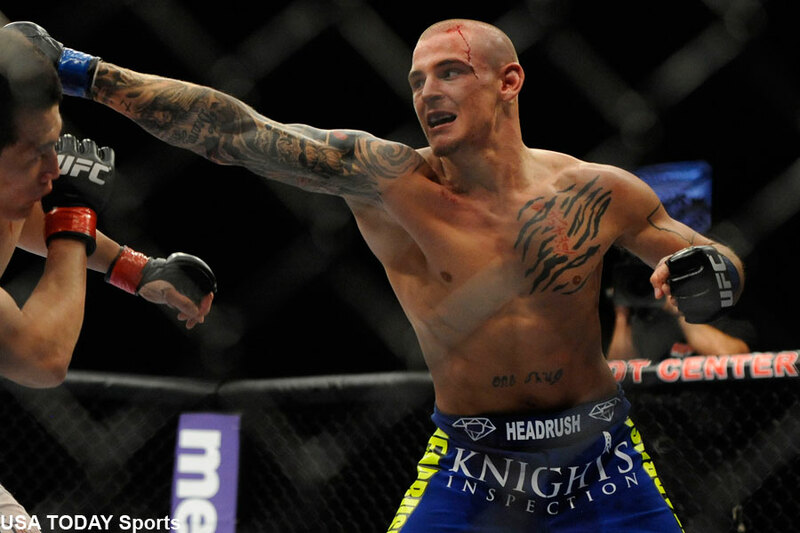 On Monday, a lightweight battle between Dustin Poirier (pictured) and Bobby Green was added to the UFC 199 roster. Brian Martin of Los Angeles News Group first reported the matchup, which was subsequently confirmed by UFC VP of PR Dave Sholler. Poirier is perfect through his past three fights since moving from featherweight to lightweight. “Diamond” was most recently seen posting a unanimous decision victory over Joseph Duffy in January. Green, meanwhile, is looking to bounce back from November’s decision defeat to Edson Barboza. The former Strikeforce star had rattled off eight straight wins prior to facing the Brazilian. UFC 199 goes down June 4 inside The Forum in Inglewood, California. A pair of championship affairs will headline the card when middleweight champ Luke Rockhold grants Chris Weidman an immediate rematch in the show’s featured contest. A trilogy between bantamweight title holder Dominick Cruz and Urijah Faber serves as the co-main event.